January launches a new feature at TheSurvivalMom blog: Skill of the Month. Each month I’ll post a new skill that should be in the repertoire of every SurvivalMom. Newbies can learn the basics and report their experiences (both good and bad!) and experienced moms can lend their advice and support. Guys, you’re welcome to come along for the ride! We can all learn from each other. If a perfume company could bottle the smell of freshly baked bread, I swear it would be a hit. What man on earth could possibly resist that smell, but it’s a smell found in too few kitchens these days. Bread-baking isn’t exactly a lost art, but when moms are rushing from Point A to Point B and beyond every day, picking up a loaf of Roman Meal is the simplest option, to say the least. However, for those of us who have decided to stock up on wheat, we’ve gotta learn what to do with all that wheat and making homemade bread is at the top of the list! This month our Skill of the Month is bread baking. Yep, baking a loaf of bread from scratch. Now, to some of you this is so old-hat that you’re already bored. What we need from you, though, are easy, no-fail recipes, tips on making the perfect loaf, etc. We really need voices of experience! And, I’m challenging you to add a new bread recipe or skill to your repertoire. Have you made your own sourdough starter? Have you tried mixing different types of wheat? How about experimenting with baking bread in a solar cooker or over a campfire? Try something new this month, and tell us about it! If you’re new to bread baking, you can start with recipes that call for all-purpose or bread flour. We won’t make you grind your own wheat, but if you’re ready to take the plunge, buy a pound or two of hard-white wheat, scour eBay or Craigslist for a “starter” wheat mill, and then get going! You can try out my basic recipe found in this article. Everyone is welcome to share recipes, websites, YouTube videos and any other resources you discover along the way. If our grandmothers and great-grandmothers could master the art of baking bread, then so can we! If you have a bread maker, you can use that handy appliance to mix your dough using the ‘dough’ setting. Once the dough is ready, remove it from the bread maker, knead, form your loaf, and let it rise for thirty minutes before baking. If this is your usual routine, then ditch the bread maker and mix the whole darn thing with your two hands! In terms of practical survival, bread is great as a meal stretcher, and once you find a recipe you really like, the ingredients are easily memorized. The ingredients for bread are easily found in any grocery store, except the actual wheat, and are all very economical. I believe that wheat will never be cheaper than it is right now. My favorite source of wheat, Honeyville Farms, has been out of hard white wheat for about three weeks now and prices have been steadily rising. If you’re not sure where to buy wheat, try contacting a nearby Mormon/LDS church and ask them for help. They might know of local growers or farmers who deliver to your area. Some of my blog sponsors, such as Emergency Essentials and Ready Made Resources, sell wheat. Shop around, compare prices and shipping charges, but this is a good time to jump into purchasing wheat, starting with Hard White Wheat. Tip: If you’re purchasing wheat in five gallon buckets, you can plan on getting around 35-40 loaves of bread per bucket. For resources right here at TheSurvivalMom, check out these articles. The clock is ticking… Our Skill of the Month has officially been launched! Just a couple things: first, my local Walmart has started carrying whole wheat berries, both white and red wheat. I can't recall the brand name (as it's way too early this morning), but it's the same brands sold in many catalogs and online. I think Bronze Chief (?) is one of them. Anyway, it runs about $13 for 25lbs, which is way cheaper than having it shipped from Utah to Ohio. Might be worth checking into if you're wanting to buy wheat. Second, the most helpful tip I've found in making wheat bread is adding an enhancer to the dough. You can buy commercial dough enhancer from places like Emergency Essentials or you can simply add 1/4 dry milk+2 T cornstarch+2T lemon juice to the dough. The difference it makes in the texture and rise of the bread is amazing. Is the homemade enhancer added to what size batch of bread? I normally add that amount for up to 2 loaves. 1/4 what? teaspoon, Tablespoon, cup? Is the !/4 a cup or tablespoon in your bread dough enhancer? Hate to say I found it here, but in Ohio, I saw a 25 pound bag of wheat in the baking aisle at Wal-mart. Pretty economical too ( I think around $13 – $15, don't quote me on that). I live in Ohio also. My daughter and I found hard white wheat at a feed and seed store for $9.00 / 50 lbs. Her father-in-law suggested the place. We were thrilled. The people there were flabbergasted, though. They couldn't figure out what we would do with it. When we told them it was to make bread, they were astounded! I'd check around and price some of these places. Might save you some. Some people routinely buy their wheat from feed stores. The only warning I have heard has to do with the pesticides that might be used on wheat intended for feed versus "people" wheat. Also, feed wheat doesn't have to go through the same cleaning process so you may find bits of chaff or whatever. That's a great price, though, and feed wheat grows right alongside "people" wheat, so the wheat itself is exactly the same stuff. Make sure the feed and seed grain you're buying doesn't have a fungicide added, as is often the case with 'seed'. 'Feed' grain is human edible, just frequently not as clean; more bits of stones, chaff, weed and straw fragments. Please be extremely careful as Ohio wheat crops were widely infected by Vomitoxin this year and levels considered safe for human consumption are waaaay different than for livestock consumption. The Ag people I talked to said to assume any wheat from Ohio was contaminated….I wish I'd known it before I spent money on local wheat!!! In ohio you could probably get wheat up in Amish country. You can get everything in Amish country, its awesome. I'd move there is I could but I like electricity too much…and I like my cellphone too, cell phone towers are nice. lol. Back on topic-ish. If you live in Ohio head up to Amish country and have a look around the shops. They have just about everything, Lehmans has tools and books and such. And there are plenty of bulk food stores around. Our favorite is the Ashery. We stop there buy whatever we need (spices/herbs at awesome prices) plus some stuff we don't like homemade candies and older candies that i don't see in the store anymore. I'm just babbling now…so I'll stop. As to bread baking…it will have to wait until I have a kitchen. I'll put it on the list of things to do when I have an apartment. This is one of my goals this year, to master this beyond using my bread machine. So looking forward to this series! I live in the UK and wheat is not something we see in our stores at all. An online search only seemed to provide details of commercial companies selling it by the ton. Does any UK reader know of somewhere I can buy it? Haven't bought any (yet) as I need to improve my storage before purchase. Thanks, I'm not sure about buying wheat just yet but will keep the link. I like the new uk site, will definitely spend a lot of time there. Try animal feed stores! They may also sell in bulk, but if you call you may be able to arrange a smaller shipment. I inherited my mom's bread machine when she died 2 years ago and I haven't done a single thing with it. I have done a little research and watched some you tube videos so I guess I'll take the dive and join your January challenge. I need to learn to make bread. Will be looking for an "all-purpose flour" bread recipe and start with that. Maybe some day (before the "stuff"HTF:) I'll be able to step out and buy me some wheat. I'll probably post on my blog about my bread making experience (if it turns out good:) and I'll link back here to you. Thanks Survivial Mom…I love your blog and look forward to MORE preparedness! Hi Lisa, I make bread regularly for the family. All by hand, no bread mixer, etc. Just a big bowl and wooden spoon to get started. I do six loaves at a time since that's what my oven will hold and freeze the extra. Here's the recipe I use and a basic version of it. It uses half white flour and half (red) wheat flour. I'm thinking it wouldn't take much change if I switched to all white wheat flour. In fact, my kids get all excited about white bread from the store. They don't know how good they have it! But on the lines of this challenge, I'd like to bake a loaf or two in my sun oven in Utah in January. We'll see how cold a day I can pick for it! Angela, let us know how your sun oven bread turns out! I need to do that myself here in Phoenix. The days have been really chilly, not Minnesota-chilly!, but quite cold for us. Glad you liked it, Stacy. It's our favorite here. So here are the 2 recipes that I've found for any "newbie" bread makers out there like me – the first is the one for my bread machine which is the one that I'm going to try today. – Measure and add liquid ingredients to the bread pan. – Measure and add dry ingredients (except yeast) to the bread pan. – Use your finger to form a well (hole) in the flour where you will pour the yeast. Yeast must NEVER come into contact with a liquid when you are adding ingredients. Measure the yeast and carefully pour it into the well. – Snap the baking pan into the breadmaker and close the lid. – Press "Select" button to choose the Basic setting. – Press the "Crust Color" button to choose light, medium or dark crust. – Press the "Start/Stop" button. We don't especially like the hard crust in the bread machine, so she makes the dough in the machine, and after it has risen once, she'll take it out and put it in two bread pans, lets them raise once, and bakes in a regular oven. Lisa, could you please check your link to your basic bread recipe. It seems to go to an admin login and not to your article with the bread recipe. Thanks so much! Ok…so step 1 is learning to bake bread. But if we're talking survival methods, somewhere along the line, you need to learn to use sourdough starter – or at least learn how to save your own starter dough. Packages of yeast are wonderfully convenient (and Costco has a 2# pack for about $3.50, and it stores well in the freezer) but if we're talking survival, those packages probably aren't going to be available. Sourdough may not be what you're looking for, but the methods for producing it are the methods you should consider part of the bread making "class". Personally, I have a bread machine, and the biggest problem is having the bread last longer than it takes for it to reach "cool"…starting from when it's cool enough to start slicing! Slicing is also a problem – some people in this family just can't cut bread in a straight line! You end up with skinny at the top, fat at the bottom, and then the reverse when you try to get it straight again – which of course, you _have_ to do! The only solution I've found is to bake the bread so that it's cool before everybody gets home, gets up in the morning or whatever it takes so that nobody starts into the fresh loaf, and then buy a bread slicer jig…or whatever you call it. It's a wooden box with cuts in the sides at bread slice width to guide your knife to make straight cuts. I was lucky – picked one up used. The new ones I've seen are pricier than I thought was reasonable. I'm so glad you brought up sourdough starter! Yes, I agree that it's an essential skill because our yeast won't last forever. Slicing cool bread is the only way to get even slices. I don't have a bread slicer yet because no one in my family seems to care if their slices aren't perfect! 1.Preheat oven to 350 degrees F (175 degrees C). Grease a 9 inch round cake pan. 2.Combine the rice flour, tapioca flour, sugar, baking soda, baking powder, and salt in a large bowl. In a separate bowl, whisk together egg and buttermilk . Make a well in the center of the dry ingredients and pour in the wet. Stir just until the dry ingredients are moistened. Pour into the cake pan. 3.Bake for 65 minutes in the preheated oven, or until a toothpick inserted into the center comes out clean. Cool on a wire rack, for 10 minutes before removing from the pan. Wrap bread in plastic wrap or aluminum foil and let stand overnight for the best flavor. I love my bread fresh and hot, and I don't care that much if it's cut crooked. LOL Sometimes I make it in a round pan, and we just tear it apart into hanks while it's still warm. It's the best way to eat beans and bread. I've made bread from scratch off and on since I was a teenager. I first learned to bake from scratch when I was the cook at a dude ranch during high school summers. Make a sponge by mixing together in a small bowl 2 cups of the bread flour, the water, and 3 teaspoons of yeast. Set aside. In a small pot, combine the white and red beans and cover them with a few inches of water. Bring them to a boil and cook the beans for about 45 minute, or until they are almost cooked and still have a little texture to them. Add the lentils and barley to the pot, return the water to a boil and cook the legumes for another 15 minutes. Add the millet and bulgur wheat to the pot, return it to a boil (if needed, add more water) and cook for about 5 minutes, or until the grains and legumes are almost cooked. Strain this mixture through a mesh colander, squeezing out any excess moisture. Transfer to a food processor and pulse until the mixture is a coarse paste but not smooth. Allow to cool to room temperature. Transfer the sponge and the legume/grain mixture to the bowl of an electric mixer that has been fitted with a dough hook. Add the remaining cup of bread flour and 3 teaspoons of yeast along with the whole wheat flour, and spelt flour. Also add the wheat gluten, honey, and olive oil. Run the mixer on low, just until the ingredients begin to form a ball, then add the salt. Run the mixer on medium speed for about 10 minutes, then transfer to a lightly floured work surface and knead by hand for another couple of minutes. Place the dough in a bowl at room temperature, cover it with plastic wrap, and allow it to ferment for 1 and 1 1/2 hours. Dust a baking sheet with the cornmeal. Remove the dough from the bowl, divide it into two pieces, and gently shape them into balls. Place them on the baking pan and cover with a towel. Allow it to rise for 1 hour. Position an oven rack to the center of the oven and place a shallow pan of water directly on the oven floor. Preheat the oven to 350F. Using a sharp knife, slash the loaf and put it in the oven. Bake the bread for about 30 minutes. Remove it from the oven and place it on a wire rack or towel to cool before slicing. Thanks for the recipe! I'm always looking to try something new that comes highly recommended! There's a company called AAOOB Foods that sells Ezekiel Mix already pre-mixed and packed in #10 cans or five gallon buckets with or without oxygen absorbers. They have a website and will ship to you. This might be a good option for those who'd have trouble finding all the various ingredients locally. Thank you so much for posting the Ezekiel recipe. I have looking for a good recipe for that for awhile now. Been making WW bread and sourdough for a long time now. I have bought Ezekiel bread many times, but am looking forward to trying my own. I already love this "Skill of The Month" feature. I have planty of practice with quick breads but have never made a loaf of regular bread without my breadmaker so I can't wait to try a few different recipes this month! I do have one hint for anyone looking to make a quick bread – anytime I make banana bread I add half a bag of dark chocolate chips to the recipe. The chocolate melts into the banana bread and gives a wonderful taste. And dark chocolate is good for you too. I can’t stand dark chocolate, but banana bread is a favorite around here. The problem is bananas rarely last long enough to go brown. I just made up a double batch of banana bread yesterday, used the dough to make muffins. I think the only reason there’s still some left is I also made chocolate chip cookies. I love to bake, but have only tried “regular” bread once. It was a dismal failure and I haven’t tried since. I won’t have the money for any more “extras” for baking until next payday, but I will definitely get the yeast and everything then. I'm excited about the skill of the month also. I've baked bread for years but have never perfected this and know I need to spend some time working on it. My oven isn't working right now, but I could try to bake bread on the woodstove. That would put a survival twist on the lesson. I've also been making fry bread (a native alaskan version) and Johhny cakes. Before anybody cries "Oh my, store bought yeast won't last long, we'll all starve!" Here's how you harvest your own yeast. Grate up raw potatoes. First rinse in a little bit of water that you're going to keep, then second rinse in more water you can do whatever you like with it. make hash browns with the 'taters. Add a tablespoon of honey or sugar to the first rinse water you kept (2 or 3 cups). Put it in a wide shallow dish, like a pie pan. Put that in a breezy window, or outside where it won't get blown in grit and leaves. It should get fuzzy in a few hours. That fuzz is wild yeast. Gently stir the fuzz back into the water a couple of times until you have a good handful of it forming. You can now use the "fuzzy water" to make bread, or scoop the fuzz off and let it dry on wax paper. Keep scooping until that batch of water quits growing more yeast. (1 or 2 days). This home caught yeast is weak. To get good high bread you'll want harvest from several batches of potato water. Keep a handful of dough, mixed into a thick batter with a cup of warm water, to make your own sour starter. 1.Are we grating lots of potatoes for this or 2-3 large potatoes? And why the second rinse if we don't have to keep the water? 2.Would you use a special bread recipe with the "fuzzy water" or just replace warm water and yeast with this "fuzzy water". 3. How do you keep the starter for the next batch and how exactly do you use it? April- Good questions. I see I wasn't as clear as I'd hoped. 1. One potato does it. The second rinse is for the sake of the hashbrowns, to take out the excess starch so they are crisp and clean tasting. 2. Breads that you don't expect to get too high and fluffy would be best. Wild yeast isn't all that reliable especially until you really get the hang of it. Just use the fuzzy water in place of the water and yeast called for in the recipe. Or save the 'fuzzies' and dry it until you have several batches and use just like dry yeast. 3. Once you have bread dough, and have let it rise once, put about a cup of that dough in a crock. Add a cup of warm water and a pinch of sugar and stir into a batter. keep it in a cool place. Use just like regular sour dough starter. It will get that "sour" taste and smell as time passes, and get more yeasty too. There are all sorts of sites on-line that tell about sour dough. find one you like best. If you want fresh yeast taste, you have to go through this every time you make bread. Keeping it as sour dough saves you this, but some don't like it sour. (I don't). The pioneer Grandmas always had a dish in a window collecting yeast since they made bread 2, sometimes 3 times a week. Thanks for clearing things up. Sounds simple enough, once you get the hang of it. It's not a bad skill to learn. We like sourdough, I used to buy it often because it's easy to find milk-free. Now I make most of our bread. I better get started on my challenge for this month. I've been baking my own bread for 25 years. I did it the old-fashioned way, by hand. A couple of years ago, when I first learned about Honeyville Grain and wheatberries, I purchased a Nutrimill and a Bosch Mixer. Then I used a very simple recipe to turn out fast, delicious bread every time. – 4 cups warm water, couple of tablespoons of live yeast, tablespoon of honey. I add some dough conditioner and vital wheat gluten, give it a whirl to mix then let it rest for 20 minutes. During that time I grind about 6 cups of grain, add a tablespoon or so of salt to the yeast mixture and add the ground flour a half cup at a time on low speed. When the dough is pulling away from the side, I switch the bosch to setting number 3 and let it work at the dough for five minutes. I oil a glass bowl and my hands and dump the mixture into the bowl, overturn another bowl over it and leave it to double in size. Then I form three loaves and place one in each of three loaf pans, cover them with bowls or plastic container tops or whatever and what for them to double in size. Then I bake at 350 for about 35 minutes or until done. Freshly ground grain is warm grain so that helps the dough to rise. I hear ya-that's the trifecta! Honeyville Grain, Bosch Mixer except I ended up with the Wonder Mill. Best combo for making wheat bread I've ever found. Thanks for the tip on placing bowls over your loaf pans. I've been struggling this winter with getting my loaves to rise and this tip will really help! I love my Bosch mixer, the other mixers motors just don't cut it. It's so nice to whip out 4 loaves and then stand back and let the fam have at them! Nothing smells as good as fresh wheat bread baking in the oven! Mix the flour, yeast, and salt in a medium bowl. Add water and incorporate with a wooden spoon for 30 seconds to 1 minute. Lightly coat the inside of a second medium bowl with olive oil and place the dough in the bowl and turn to coat with oil. Cover the bowl with plastic wrap and let the dough rest 12 hours at room temperature (about 65-72 degrees). Remove the dough from the bowl and fold once or twice. Let the dough rest 15 minutes in the bowl or on the work surface. Next, shape the dough into a ball and generously flour a 15 inch piece of parchment paper and place the dough on it. Dust flour over the top of the dough. Cover the dough with a cotton towel and let rise 1-2 hours at room temperature, until more than doubled in size. Preheat the oven to 425 degrees F. Place the oven safe pot with a lid in the oven at least 30 minutes prior to baking to preheat. Once the dough has more than doubled in volume, remove the pot from the oven and place the parchment paper with the dough on it in the pot. Cover with the lid and bake for 30 minutes. Then remove the lid and bake 15 more minutes, uncovered. Remove from oven and take the bread out of the pot to cool. This isn't so much for making sandwiches, but it is great warm with butter and jam or with soup! One of our favorite breads ever! Oh, I forgot to mention that I have done half wheat and half white flour with the Artisan bread recipe and it is still delicious! We have always made 100% whole wheat bread. My kids will hardly eat anything else. 7 cups warm water, 7cups hard red winter wheat berries, 2/3 cup oil, 1 cup honey, 3.5tbs active dry yeast, 1/4 tsp powdered vitamin C, and 1tbs salt. Grind t…he wheat berries, pour water in bowl of bosch kitchen machine. Add oil, honey, yeast, vitamin C, and 7 cups flour. Then add salt while it is mixing. Grind 4 more cups of wheat and add to bowl. Allow mixer to knead dough for about 10 minutes total. Remove from bowl and form loaves. bake at 150* for 30 minutes, then turn temperature up to 350* for 30 minutes. Remove from oven and loaf pans. Butter tops of loaves, slice and enjoy. This is the recipe my mom has been using for the last 30 years. All of the kids love it so much that as we have gotten married or moved out, we have all bought Bosch Kitchen Machines and Grain Mills. I've been baking almost all of our bread for the past year, using a Nutrimill to grind Prairie Gold hard white wheat berries. One word of caution for folks who plan to use freshly ground whole wheat flour: the dough is thicker and will wear out most "consumer-grade" mixers. Even KitchenAid mixers will not last, and you can hear the motor straining. The Bosch is a great alternative, but I found something I think is better, which is a used Hobart commercial mixer I found on eBay. Even used it was more expensive than a brand-new Bosch, but this thing is built like a tank (warning: it weighs almost 50 lbs) and will mix large batches of dough without appearing to even notice that it's there. That's probably because of the reduction-geared transmission that keeps the motor running at full power for the slower mixing speeds. And just for fun, I have proven to myself that I can run both the Nutrimill and the Hobart mixer off an inverter attached to a deep-cycle marine battery recharged by solar panels, and cook the bread — with acceptable but somewhat less than desired results — in my Sun Oven. No grid power required. Granted, I only did this once, but it's nice to know the whole system works. I have made poppyseed bread from a recipe my mom gave me years ago, but that is the only kind I have ever made. My problem is that in the winter (Kentucky), I have the hardiest time getting anything to rise properly – any suggestions on how to find a warmer spot or how to use the oven to help rise? Try putting your bread ( in pan or bowl, covered with a towel) on a heating pad while rising. Works great! Kerry, When my house is too cold to help the bread rise properly, I use my microwave. Simply take a small bowl and fill with water. Run in the microwave a couple of minutes until its very hot. Move the bowl (or cup) to the back corner out of the way and simply place your bread thats needs to rise in the warm microwave. I ususally have my bread ready to put in when I first open the door, moving the bowl with one hand and placing the bread with the other. That way most of the heat doesn't escape. Works for me. I turn my oven on low for 10 mins. Turn it off, and set the rising bread on the open door of the oven with a damp dish towel draped over it. As the oven cools, I move the bread to an oven rack and lean the door up, but still open if it's still too warm. Midge, I heat a cup or two of water in my microwave. When its hot I move it to a back corner and I place my bread to rise in my microwave. Cover the bread with a towel or plastic wrap before putting in the microwave. Will rise in half the time. The book "Adventures in Sourdough Cooking and Baking" by Charles Wilford has a real easy sourdough batter (Primary Batter B is what they call it) and a No-Knead Bread Recipe (Chapter 7) that I have finally mastered. The starter batter can be stored in the fridge, allowed to come to room temperature prior to preparation. I brush the finished breadtop with butter or olive oil to soften the crust a little. This first couple of times I used just unbleached white flour, the last time I used about 1/3 of whole wheat to 2/3 or white whole wheat. King Arthur brand puts out both regular whole wheat and the newer white whole wheat. My next efforts will include grinding my own flour and using a Sun Oven for the baking. One skill at a time. Since you posted the King Arthur flour link a few weeks ago, I faced my fear of yeast and have been winning. That website is the greatest thing since slice bread (pun intended). I've made bread, rolls, sticky buns … all received by an amazed, raving family fan club. My confidence has soared and will be embracing berries & a grinder very, very soon. Love this website & the insight from the other survival moms. What a beautiful community! Hi all – first time posting here! My late mother in law baked her own bread all of her life – she lived throiugh the war years in ITaly – they had a community brick oven that many neighbors shared. One person held the keys, one held the yeast, oe the flour – or at times each would supply their own flour! Now my husband and I bake bread from scratch – one hint from our family – put a pan of water on shelf under bread while baking – the steams makes a beautiful crust! For those who use such things to meditate – think about prayig while kneading the bread – we use it as great time for that — we are sort of like the bread being baked in the oven – a bit of leavening is plenty in our lives, too much and we spoil – too much kneading (beating down by others) also can ruin us! 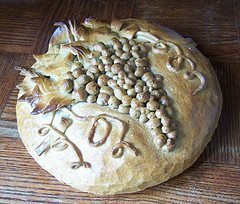 And lastly – I loved thinking about the community bread oven – we all can use the fellowship of others to help us rise and be our best – each of us takes a bit from our neighbors to make the whole loaf! The correlation spirtually is endless! I love this new feature! My hubby actually makes a really yummy oven bottom bread and Irish soda bread (without the bread machine). I am should really start learning how to make bread without my bread machine. This is just what I needed for that extra push! I made my first bread this past Saturday! It was a very, very basic white bread (I need to get some whole wheat flour). But it was surprisingly tasty. And makes wonderful toast. I'll be trying another batch this upcoming weekend, trying to soup it up a bit, add some herbs, or something. . . ^____^ hurrah for bread! Congrats to everyone who has been plunging into the wonderful world of baking bread! I made a loaf of English Muffin Bread yesterday. I got the recipe from someone over on my forum. It didn't brown at all – not sure why, but my kids love the flavor. They're having it toasted with butter today. Even though the loaf didn't rise as much as I'm used to, it still had a very nice texture. It was also very easy to make. Does anyone have a recipe for a yeast-free bread? you would need to use Pamela's Baking Mix which includes Rice Flour, Tapioca, etc but NO WHEAT to product a gluten (wheat)-free product………..is this what you are needing? Wheat can be used to make it's own yeast. I just made my first loaf of home-made/from-scratch bread today and it came out GREAT!! I'm very proud of myself (silly as that may sound). Can commercial/packaged yeast be frozen or at least refridgerated? Any specially consideration when using it? YES! In fact, you *should* refridgerate it. I have my unopened yeast in the freezer and my opened one in the fridge. If you keep it at room temperature you run the risk of the yeast activating and dying on you. It lasts much longer cold. I use mine the same way from the fridge as I normally would. I made Monkey Bread (yeah, not really bread, I know) and Cinnamon Swirl Bread this week. Not the healthiest, but it's a start! After wearing out two bread machines & tearing up a Kitchenaid mixer, I got an Electrolux Assistent mixer from Pleasant Hill Grain. Now I can mix up enough dough for 4 conventional loaves, 3 baguettes, and 6 big hard rolls, all at once. Hand kneading=not necessary. I bake every 2 weeks or so and freeze the surplus. I copied a recipe from a bag of King Arthur flour & have been using it for 3 years, varying the sweetening agent and the proportion of white flour to wheat for variety. I quit using honey. The bread doesn’t rise as well with that and it costs too much anyway. My biologist husband I discussed this; he said it is likely because honey has a natural antibiotic property which is hostile to yeast. He said the bees might not remain healthy for long if wild yeast were able to flourish in the warm, damp interior of the hive. (Did I mention that he is brilliant?) For whole-wheat bread I switched to molasses and the results were greatly improved. I use plain white sugar (I know, shock, horror) in white bread, which isn’t very often. I don’t use as much of either ingredient as the recipe calls for –just enough to feed the yeast and produce a light, tasty loaf. I use my 9-tray dehydrator for the first rising. Then I put the conventional loaves in the dehydrator for the second rising in the pans, and I put the baguettes and hard rolls under a clean flour-sack towel on top of the refrigerator. The top of the refrigerator is the warmest place in my kitchen in the winter because, unlike my oven, it isn't on an exterior wall. In the summer I can proof dough in my oven, which is on a poorly insulated exterior wall. I place a pan of warm water in the oven with the pans, set it on "bake" and set the control at 400 degrees F, turning it off after exactly one minute. This uses less electricity than the dehydrator. I don't use dough conditioners unless you count vital wheat gluten as a dough conditioner. I have to watch how much of that I use if I'm using only Bronze Chief whole-wheat flour in the loaves because it is so high in gluten that I will end up with very tough bread if I add too much. That result is hard to describe. It isn't dry, but it is tough. Baking bread regularly has become part of the normal routine for me, like doing laundry or giving my husband a haircut. Cannot read comments made by others. Anywhere on this site, that is. So long until this gets straightened out. Does that mean 1/4 cup, tsp or what measurement?? I did it! I've done three batches of bread. First try: "Amish White" – Yummy!. Second try: "Country White". Even better! Then I finally remembered to buy vital wheat gluten and I took the plunge and ground wheat for the first time. I think I probably didn't grind it fine enough, but the bread was pretty tasty for a first effort. I don't quite have the hang of telling when it is done baking yet, though. Tapping for the hollow sound is hard for me to judge. How are you going to make bread in a survival situation where there is no power? Bread machines and ovens won't work. Dutch oven?? I have stocked up on canned goods, bottled water, and MRE's from friend in military. I am interested in stocking up on grains but I am wondering how to use them when the power is out. It's not like I have a spare brick oven and a chord of wood to cook with. Any help/suggestions would be appreciated!!!!!!!!!! I have one friend who loves using his solar oven for bread baking (and all other cooking). He also uses a Dutch oven quite successfully. He has been doing this with his wife and kids (and how his grandkids) for a long time so I'm guessing it's not as easy as it sounds but I'm getting ready to try the solar oven first. I am buying a Dutch oven to use in my fireplace this winter. I have a fire going anyway so it makes sense to give it a try. Well, given that I make bread every monday and typically end up making flat breads, or quick breads or dumplings etc thoughtout the rest of the week depending on planned menu.. I am good on the Challange for this month..
Just found your site though your post on Canadian Doomer.. thought I would join in.. I sent this link to a friend who is more of a foodie than a prepper because she is going to try and bake bread in a solar oven, lots of great info in all of these comments! Been baking my own whole wheat bread for years, but tonight I decided to try it in the wood stove. I should have: A) cleaned out the ashes first, B) Gotten a better bank of coals, C) Chosen a less windy night as the wind kept coming down the chimney and stirring ashes up onto my bread. The end product was a little doughy in the center and ashy, but delish. I think the above changes would yield a loaf comparable to electric oven. Gotta go eat some bread now. We're a young family with 2 children living on an 18 acre homestead. I'm old hat at making bread, as I've been doing it from scratch and by hand for years, but I was wondering if anyone would know how to bake in/on a wood-burning stove (used primarily for heat, not cooking). 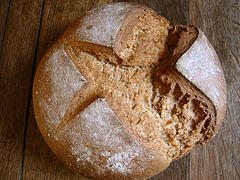 Also, there are some really great recipes for no-knead bread in the Mother Earth News archives. It's probably the first thing I've ever googled and come up pretty much empty. I made mine in our wood burning fireplace insert by making a medium sized fire( I ran out of coals so you might try a larger fire) and getting (what I thought would be) a decent amount of coals. I pushed the larger coals to the back of the stove and made a thin layer of coals in front of it. I placed a dutch oven on those front coals and wedged my bread pan into it. In retrospect I would either try placing a heavy bread pan directly on the coals or slightly elevated on a camp style grill. I was worried the bottom would get too brown, but it ended up a little under cooked. I let it cook that way for 20 min, then rotated it for another 20. My end product was a little doughy, but I think getting rid of the dutch oven and having more coals to begin with would help. since there isn't much info out there It looks like you and I are the pioneers here. I'll be experimenting more in the next few days and let you know what I figure out. Good Luck! Thanks so much! I wasn't sure if I could stick the bread into the coals without burning it, and I didn't have a dutch oven that was large enough for my bread pan. I guess I'll give the coals a shot. Seems to me that it would be worthwhile to figure out if the power does infact go out for any length of time. Meg, I asked about this on my Facebook page (not sure if you're a visitor or not), and it seems that the Dutch oven is the way to go. One person said, "Dutch oven bread is the way to go. It works on top of the woodstove, over coals or on the camp chef. Pizza is also real good in them." I'm not sure if he means to put a loaf pan IN the Dutch oven or just put the bread dough in. Someone else commented that one of the Foxfire books might have instructions. Good luck! I really miss those 25 lb bags of restaurant flour they used to sell at Costco for cheap. Does anyone know if BJ’s or Sams or the like sell those big bags of flour? I would be willing to buy a membership just for that one product. P.S: It is not easy though. I have a manual Family Grain Mill, made by Messerschmidt (German aircraft). It’s currently about $200 from Homestead products, takes many attachments, and has worked great for the last 20 some years. It produces from cracked grain (hot cereals) to almost store bought fine flour (if I sifted I’d get it that fine, it even grinds Amaranth). Don’t get the cheap grinders like the tiny back to basics or a coffee grinder, you get the same fineness as my $30 Corona, or it breaks, usually both. I got my FGM after a couple months research and talking to people who grind grains. Most had a Corona for nuts, beans & corn, and a mill like FGM, Lehman’s Best (almost identical to FGM) or the big Country Living or whatever that nice $400+ one is, for fine flour, and had tossed their cheap grinders and ones that couldn’t hold up to 1-3 loaves a week. I will run large or very hard stuff thru my Corona (I bought 1 for $25, then was given another as “it won’t make bread flour,” which it won’t, it’s basically to crack corn). Then I fine grind on the FGM, as it’s actually easier, as well as less wear on my more expensive mill. I was also looking at a probable lack of more grinding burrs if the programmers didn’t avert Y2K. Wal-Mart carries white Prairie Gold wheat berries in 25# bags, and I think the red is Bronze Chief, both are Wheat Montana Farm. The white doesn’t have the bitter taste the red wheat does, and the taste is fantastic. Whole wheat bread haters love my whole wheat bread made with hard white wheat. For easy, and very good breads to make, check out New Artisan Bread in 5 Minutes, and their Healthy Artisan Bread 5 Min. I usually have a 6 qt container in the fridge. 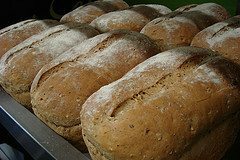 Also Peter Reinhart has Whole grain breads and Artisan Breads Daily. He goes a little further into how and why. Both are no knead breads. Peter has a 10 part + PDF’s Artisan Bread class on Crafty for $29.